Hi everyone! 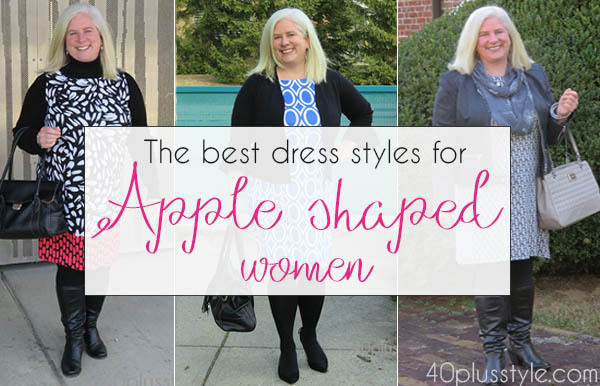 Dresses can be the apple-shaped woman’s best friend! 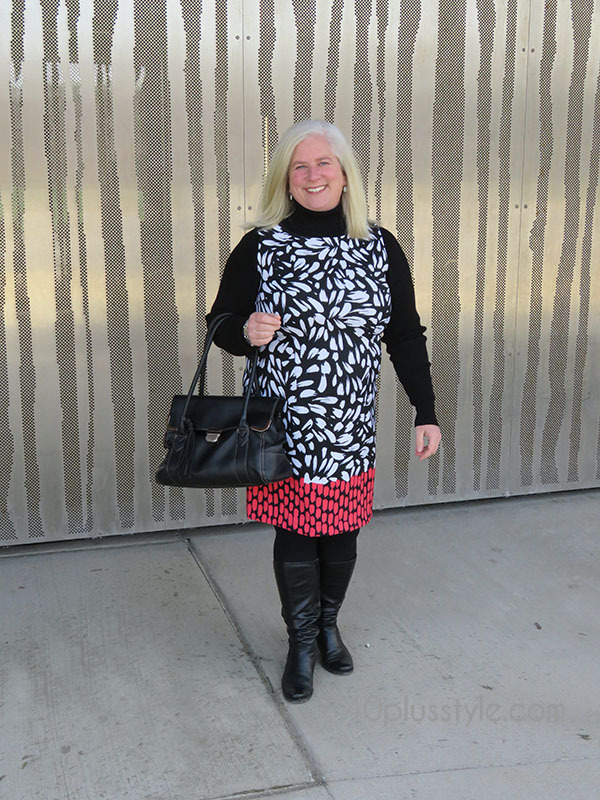 Because you don’t have to worry about the pesky waistband, you can find a well fitting dress that is flattering and there are some really beautiful patterns out now with new types of material that hang flatteringly. Like the dress below, this is a style that has no shaping which is usually good for our shape. Now, this doesn’t mean it has to be a tent. Look for a shift with a straight style, instead of an A-line shape. You can add a structured jacket over the dress to make the dress look more fitted than it really is. J. Jill always has this style with pretty patterns and nice fabric that hangs well. This style is a simple design, without a lot of structure. So that means not a lot of pleats and darts and seams. It’s designed to be a little more fitted than the shift dress. Like the dress below, it has a few seams below the bust to give it a bit of shape, but that’s it. Look for fabric that has some stretch, especially if you have a big bust. Test the fabric before you even try it on. Don’t wear a dress with yards of fabric. It will generally make you look bigger. Check to see how the fabric hangs. If it clings too much to every lump and bump it will probably not be flattering. A heavier weight or a fabric like rayon, hangs straight without clinging. Stay away from dresses that have a lot of structure. Too much structure in a dress means too many places you can have a fit problem. Horizontal seams are not our friend, especially if it’s at the waist. Does it button down the front? Probably not going to work. Stay away from anything that has a tied belt. Usually not a good look unless your waist dips in, which if you’re an apple-shaped woman, your waist usually does the opposite. Don’t let the dress hide parts of your body you’re not comfortable showing. Instead, let the “third piece” do the hiding. By that I mean wear a more fitted dress and cover your tummy (or bust or behind or whatever) with a sweater or jacket or even a scarf over your dress. If you already have a dress that has some “tent-like” tendencies, you can rein it in with a shirt belt or a stretch belt. These types of belts are 100% elastic that I wear over the dress but doesn’t require belt loops. Wear it at your natural waist and make sure it’s not too tight because you don’t want that dreaded midsection dent and make sure the belt buckle is pretty substantial. Not rodeo queen substantial, but not tiny teenager belt either. To pull this look off though, you have to wear a jacket or sweater over the dress and belt to give the illusion that the belt is legit! I hope these tips help you venture into wearing more dresses. They really can be a flattering addition to your wardrobe. Do you have any other tips for wearing dresses for our shape? Great article with very useful information. Thanks!! I’m so glad Jacqueline! Have fun shopping! >>Stay away from dresses that have a lot of structure. Too much structure in a dress means too many places you can have a fit problem. Horizontal seams are not our friend, especially if it’s at the waist. I really appreciate hearing this, especially b/c most fashion blogs say “structure is our friend.” It’s not necessarily so, as you’ve affirmed. Thank you Bette! Most clothes are designed for a smaller waist or at least a neutral waist, where ours is usually the widest part of our body. So, we really have to approach clothes advice from the opposite perspective. I never knew the difference between a sheath dress and a shift dress! Thank you. This was an excellent article! Love this article! You are sharing the awesome dressing styles. Thanks a lot for sharing the great article. 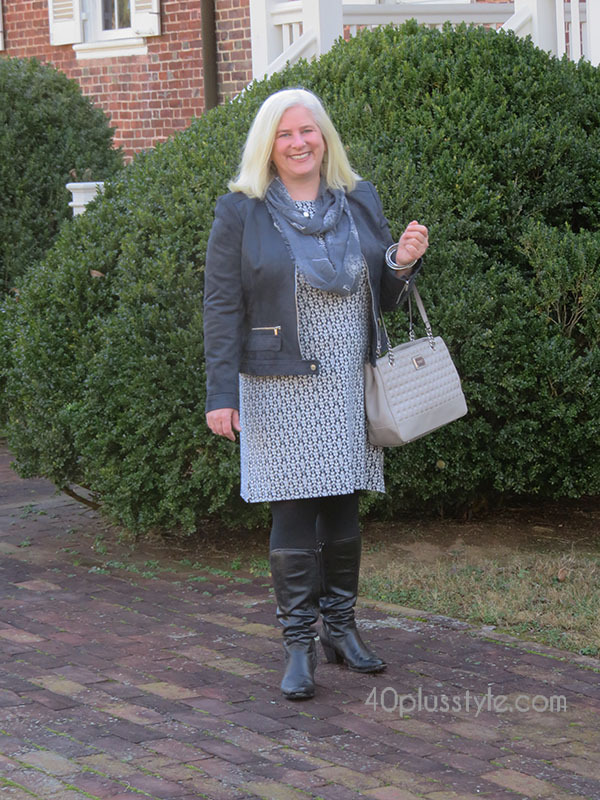 Previous post: #40plusstyle inspiration: the best jumpsuits! – which outfit is your favorite? Next post: Beauty interview: Rosemond Perdue’s grooming and makeup secrets!